NASA has selected United Launch Services LLC of Centennial, Colorado, to provide launch services for a mission that will address high-priority science goals for the agency’s Journey to Mars. Mars 2020 is targeted for launch in July 2020 aboard an Atlas V 541 rocket from Space Launch Complex 41 at Cape Canaveral Air Force Station in Florida. The rover will conduct geological assessments of its landing site on Mars, determine the habitability of the environment, search for signs of ancient Martian life, and assess natural resources and hazards for future human explorers. Additionally, scientists will use the instruments aboard the rover to identify and collect samples of rock and soil, encase them in sealed tubes, and leave them on the surface of Mars for potential return to Earth by a future mission to the Red Planet. The mission will build on the achievements of Curiosity and other Mars Exploration Program missions, and offer opportunities to deploy new capabilities developed through investments by NASA’s Space Technology Program and Human Exploration and Operations Mission Directorate, as well as contributions from international partners. The Mars 2020 rover mission presents new opportunities to learn how future human explorers could use natural resources available on the surface of the Red Planet. An ability to live off the land could reduce costs and engineering challenges posed by Mars exploration. The total cost for NASA to launch Mars 2020 is approximately $243 million, which includes: the launch service; spacecraft and spacecraft power source processing; planetary protection processing; launch vehicle integration; and tracking, data and telemetry support. NASA is on an ambitious journey to Mars that includes sending humans to the Red Planet. The robotic missions of NASA’s Planetary Science Division are leading the way with the upcoming Mars 2020 rover, the InSight lander mission targeted for 2018, Opportunity and Curiosity rovers currently exploring the Martian surface, Odyssey and Mars Reconnaissance Orbiter spacecraft currently orbiting the planet, and the Mars Atmosphere and Volatile Evolution Mission (MAVEN) orbiter, which is helping scientists understand what happened to the planet’s atmosphere. NASA’s Launch Services Program at Kennedy Space Center in Florida will manage and oversee the Atlas V launch service for Mars 2020. 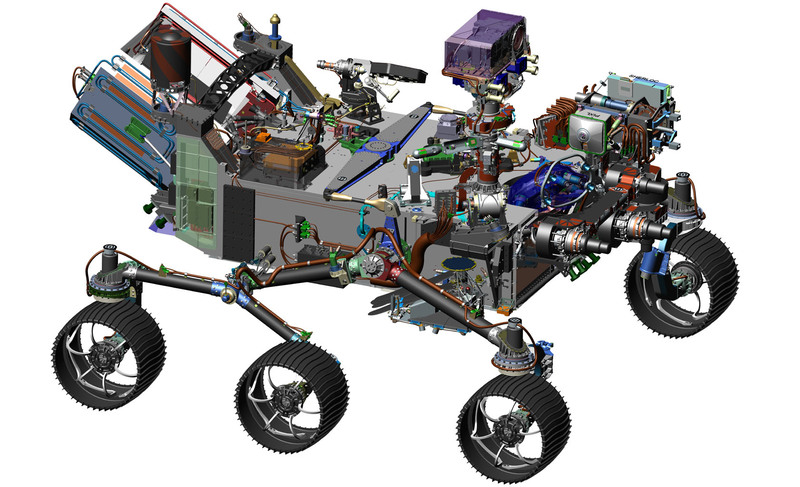 The Mars 2020 Project at NASA’s Jet Propulsion Laboratory in Pasadena, California, manages the Mars 2020 spacecraft development for the Science Mission Directorate at NASA Headquarters in Washington.